WHAT TIME SHOULD YOU HEAD TO THE TRACK? WHAT ROADS SHOULD YOU TAKE? 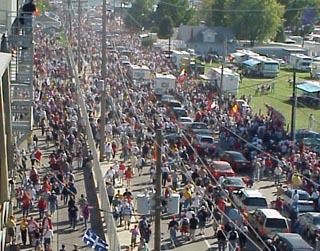 Carb Day and Race day are heavy traffic days. Rain can affect your decision when to go to the track. It takes 2 hours to dry the track. Indy cars won't practice on wet track. It is recommended that you leave by 10 a.m. on Indy 500 Race Day so that you can get parked and get to your seat in time for all the pre-race festivities. The race starts at 1 p.m. local time (Eastern Daylight Savings Time). All other days in May, traffic should not be an issue, so leave when ever you feel like it. Track closes at 6 p.m. The Grand Prix only last 3 days. From my experience, it appears people wander in all day long. I have not encounter traffic problems during this race, even when the speedway was sold out. The Formula One Grand Prix weekend features two or three support races, consequently there is almost always some cars on the track starting early in the morning and lasting all day. Show up when you feel like it! Track closes at 6 p.m. The Nascar race is also a short 3 days. Traffic in the morning will be heavy all three days. The gate opens at different times on each day. Rain can affect your decision when to go to the track. It takes 2 hours to dry the track. Stock cars won't practice on wet track. Track closes at 6 p.m. There is limited parking within the infield of the speedway. The largest general parking area is in the TURN 3 lawn and the 1st turn gravel. There is also a large square parking lot behind northern tower terrace, however its reserved for suite ticketholders, media and those with yellow passes. It is free to park inside the speedway, assuming there is room. You cannot drive RV's into the infield, nor can you camp out overnight. SOUTH off of 16th street. Always open on race day. Can approach from either direction during practice days, but must approach from the east (heading west) to enter on race day. BOTH RIGHT LANES can enter. Must have parking pass to enter here for USGP. There is parking literally everywhere miles around the outside of the track. Most every house in every neighborhood will let you park in their yard for a price. If they are a mile or more away, they may only charge $5-10. Get close to the speedway and price jumps to $20 or $30. There are some large parking lots around. The police are going to make sure traffic moves out of these lots, where as you can get stuck in a neighborhood. The Speedway will let you buy a reserved parking spot in their lots. For a map and more information, see OFFICIAL RESERVED PARKING. The Speedway owns a huge grassy lot just north of the track that you can reach on 30th street. We often refer to this lot as "The North 40". You can park here for free. The largest lot of all is called the Coke Lot. It is a huge grassy field off of Georgetown Road and 30th Street. The speedway actually owns most of it. At one time someone wanted to build a horse track there. This is probably the easiest lot to get in and out of, so I recommend using it. Sometimes they charge you $10-20, sometimes you get to park here free. I parked here free in 2005. If you are coming from downtown Indy (east going west) take 16th or 30th Streets. If you are coming down on I-65, you can exit on 30th Street westbound. *** Get off on 10th street, exit 14A, and go east to Lynhurst Drive where you will turn left (north). That will take you to 16th Street where you can turn right towards the Speedway. *** Get off on Crawfordsville Rd, US 136, Exit 16A. Traffic will be sent in three directions, but all will get to the track. *** Get off on 38th Street east, Exit 17. Go south on Moller Road, then east on 30th Street to park in Coca-Cola parking lot. 2. Get off on 38th street and head East (back in towards the city). 4. Go to the second light which is 30th Street. You can't turn right, you can only go straight or turn left. You will turn left. You will be heading East. The giant field on your right is the Coke Lot. Pull into this lot and park as far South and East as you can. Once you get to Georgetown road, you are as far as the coke lot goes. You can turn right, and perhaps find a closer spot to park, but hit a lot of pedestrian traffic. Or you can go straight on 30th and find the entrance to the North 40 free parking. Traffic and Road Construction brought to you from the newspaper. The first thing to decide is if you want to park inside the speedway, in the infield of the oval. If so, you need to get there real early on race day. Sometimes after they've closed off traffic into the infield, they may find some additional parking spots and open it back up. Once I arrived a half-hour before race time and was able to drive right in and park near the control tower. That is getting lucky though. You may drive your CAR, PICKUP, SUV, VAN, or BIKE into the track, if they allow infield parking when you go, which is almost always. NO RV's. You must drive through a tunnel under the track to get in. I do not like to get up early! I hate to sit in traffic! If you are like me, then you need to head for the Speedway either before or after the majority of people go, say 9 a.m. to 11:30 a.m. If your seats are along the front straight, you may enjoy being there watching the hours of preliminary and traditional things going on - music, parades, etc. If you are an early bird who doesn't like traffic, getting an early start may be the thing for you. The track opens at 5 a.m. Arrive sometime between that and 7 and you shouldn't have much problem. If you are caught in standstill traffic and are several miles away from Speedway, I recommend turning around and try alternate routes. Make sure you have plenty of gas and a drink for yourself incase you get caught in bad traffic. Go to the restroom before you leave too! You will not want to miss the start of the race! It is awesome! After the show of patriotism, you'll see the 33-car field driving by in formation. I guarantee that when they roar away on that 1st lap, you will get goose bumps. Some people cry. Besides the parades and the anthems before the start, there will be some kind of air show too, depending upon the weather. One year I had someone chauffuer me over at the last moment. We drove right up to the corner of the speedway and I hopped out and went in the track. However, person could never make it back to pick me up afterwards because all lanes had become outgoing traffic. Some people park so far away, I can't believe it! I usually go until I can see Speedway property before I think of parking. Those extra miles of walking carrying heavy coolers will wear you out. And remember, you've got to walk back there at the end of the day. and last, but not least... DON'T FORGET WHERE YOU PARKED!!! Make sure everyone in your party remembers incase you get separated. Note: Traffic leaving is usually worse than arriving, simply because everyone tries to leave at once, while everyone entered scattered from 5 a.m. until noon. Fortunately, the police turn many roads into ONE-WAY streets to help get everyone out of Speedway and onto the interstates as fast as possible. Unfortunately, sometimes they may make you go in a direction you did not want to go. For instance, in 2006 I came out of Lot 2 and headed south on Georgetown Rd toward 16th Street. I wanted to go right. They made me go the opposite. They controlled the traffic quite a distance away, and by the time I was allowed to go west and catch the interstate, it wasn't worth it anymore, and I just caught the interstate further south. If you don't mind missing the end of the race, you can probably avoid traffic troubles by leaving a little early. I usually hang out in the stands and wait for everyone to leave. Eventually the yellow shirts come along and tell you to go. Once outside, you can walk around looking at the vendor's stuff, have a cookout back at your car, play frisbee in a field, or whatever, to kill a little time. If you were to wait around for about 3 hours, you can probably cruise right out with just light traffic. If you were to get in line, you might be sitting there burning gas for several hours. I used to find I could exit out on 30th and head east pretty easily. I tried parking over in the neighborhood across Georgetown and its been murder trying to get out of those neighborhoods even after I took my time leaving. Its best to head immediately for a main street when pulling out of your parking spot. You have to apply for handicap parking and you must apply for every race, every year. For further questions, call 1-800-822-4639 or (317) 492-6700. There is no general admission for the Brickyard 400. Parking in giant lot north of the speedway (off of 30th street) or in the speedway's infield is FREE. Make sure your cooler is not larger than 14" x 14" x 14" !! Do not have glass bottles in your cooler!!! Don't jokingly mention "bomb" or something to send the terror police into a frenzy and you off to jail and delay the line for hours!!! These tips will help you and everyone else get into the track quicker! Copyright � 1996-2006 IndySpeedway.comAll Rights Reserved. Created Dec. 26 1996.